We've talked plenty before about Patrick Ewing's quest for a head-coaching gig. Despite a resume that includes extended assistant-coaching gigs and an outspoken interest in becoming a head coach, Ewing hasn't been able to land a top spot. His candidacy for the Charlotte position went unfulfilled, and the Knicks didn't even approach him (or anybody but the incumbent Mike Woodson, to be fair) about their own vacancy. 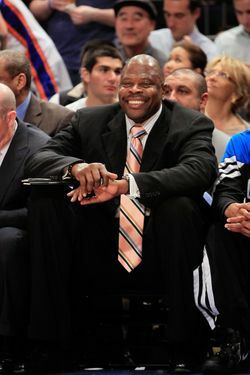 We've long puzzled over the fact that the Knicks have never sought Ewing for a position within the organization. Particularly when you consider the multitude of Ewing's teammates currently or recently employed by the team — Herb Williams, Allan Houston, John Starks, Larry Johnson (Marcus Camby and Kurt Thomas, too!) — New York's aversion to Ewing has always been curious. Well, they finally offered him a job, guys. The job, unfortunately, wasn't quite what Pat was looking for. New York has open positions in the front office and at least one empty seat on Mike Woodson's coaching staff, but their only offer to Ewing would have sent him down and away. According to Frank Isola of the Daily News, the Knicks offered Ewing the head-coaching job for their D-League affiliate, the Erie BayHawks. It suffices to say he declined. Perhaps a little miffed at the offer, Ewing turned down a job that until recently belonged to Jay Larranaga, who just left the BayHawks to become a Celtics assistant coach. It'd be sort of a backward move for Ewing, even if it meant returning to his native NBA organization. Especially with that open spot on their own staff in clear view, it was a little rough for the Knicks to suggest deploying Ewing to western Pennsylvania, but I suppose some offer is better than no offer. Or maybe not. Whatever the case may be, it looks like Ewing will have to find work elsewhere (and if not that, he can always concentrate on his sneaker re-release). The New York assistant spot is rumored to be LaSalle Thompson's to lose (Thompson is an old teammate of Woodson's), while the Erie vacancy is reportedly filled, but we don't know yet by whom. It's almost certainly not Isiah, don't worry.